Curled over the top of a rock formation, this Dragon’s stares inquisitively. A small metal tray is hidden at the top of the Dragons back where a small incense cone cane be placed. 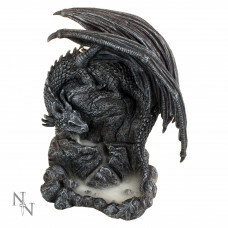 Cast in high-quality resin before being carefully hand-painted, this piece is a perfect addition to any dragon collection.